I've been enjoying some Bon Jovi on SiriusXM. Yes, I'm a fan - ever since I was 15. I can't help it. I wish I had a "before" photo of my entry hallway. It's basically littered with shoes and backpacks ALL THE TIME. I found a lovely item online at least a year ago, but hubby didn't like the color (or the fact that I even wanted it) and, at the time, I couldn't see spending the money. Then I found this little gem at The Home Depot. It's smaller, but serves the same purpose. And gives us, I mean ME, an inexpensive way to ensure we're gonna like "furniture" in the middle of the hallway. The item I wanted had a larger/taller shelf section, drawers on top, and was a table instead of a bench. But this does the trick! Each kid has a basket for shoes and can just put their backpacks on top of the bench. I'm ok with that, for now. Not sure what to use the shelves for, but probably hats and gloves during the winter. I assembled it myself - TA DA! And I think it looks great! Obviously, this is an "in progress" photo. This little guy helped out and insisted on carrying this box all the way to the registers. We stopped a lot along the way, but he was determined! And there was no assembly required on the garbage can - YAY! Oh I love Bon Jovi!!! 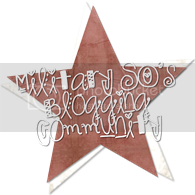 New follower here from the MHO blog hop! Would love for you to check out and follow my blog!